How to play DAV files on Windows Media Player? DAV is an encrypted format created by a DVR365, standard media players won’t work for DAV files. Windows Media Player is developed by Microsoft Corporation with the function of playing multimedia files. As a free, easy to use, powerful software, Windows users prefer Windows Media Player as the default media player. Under normal circumstances, Windows Media Player supports playing videos in WMV\ASF\MPG\MPEG\AVI formats. If someone wants to play DAF video files on WMP directly, an inevitable problem lies-WMP doesn’t support DAV files. If you’re quite satisfied with Windows Media Player but want it to play DAV files, what should you do? Download a new media player to play the DAV files? If I were you, I prefer to come up with an idea to solve the format related problem rather than be in the struggle for selecting the perfect substitute for WMP. Thus how to play DAV videos on Windows Media Player is what we should attach importance to. To play DAV videos on WMP, here I introduce a method thought to be useful and practical. [Guide] How to play DAV files on Windows Media Player? Converting DAV to the formats supported by Windows Media Player like WMV, MP4, AVI or MPG is an easy and quick approach. 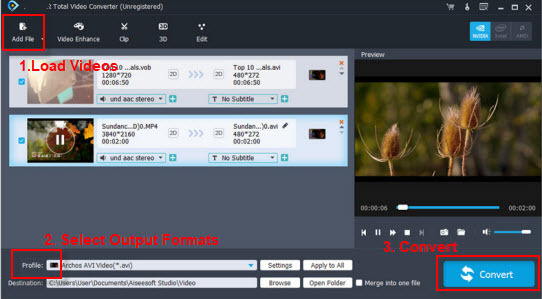 The conversion tool, UFUSoft Total Video Converter is worth being the first recommendation. The software supports about 150 formats and DAV is also included. It ensures both the converting speed and video quality of the original DAV files. Click “Format” and choose WMV or H.264 MP4 from “Common Video” as output format, which can be recognized by Windows Media Player?easily. Tips:?With the right settings you can retain the quality of the original videos while also saving space. This is particularly helpful when streaming over your network, depending on your network quality. Simply click Settings bar and you can tweak the settings to your satisfaction and even save it as preset. Finally, hit the “Convert” button at the bottom of the main interface to start the conversion. After you convert your DAV video files to WMV or MP4, click on “Open Folder” in the bottom to locate the converted files and transfer them to Windows Media Player to play your media files. How to Edit/Split/Cut/Join Canon Rebel T6 .mov Files on Windows 10 or Mac? How to Convert OGG File to AVI/MP4/MOV/WMV/MPG/FLV,etc?